Pañca means “five” and karma means “action”. Pañcakarma refers to the five actions used to purify and maintain a healthy, balanced body throughout the seasons. Why study Pañcakarma at Shri Kali Ashram? Many treatments are available for you both to learn to give and to receive according to your diagnosis by our resident doctor. The treatment above is called Netra Tharpanam. During this procedure, black gram paste is molded around the eyes to form a barrier for warm ghee to be poured into the hollows around the eyes. This therapy alleviates stressed eyes, prevents eye diseases, and strengthens the nerve in the retina. The course is a 6 months course condensed into 3 months. Students are expected to attend the full length of the course. The required attendance is part-time three days a week totalling 9.5 hours each week for three months. There will be a final test that lasts three days on the 3rd month of the course. Passing grade is a minimum score of 50%. The diploma will be issued after a period of 6 months, if the student has passed the final exam. This delay is due to the requirements of the issuing body. PLEASE NOTE: The Pañcakarma course is offered as a supplement and added benefit for the students of Shri Kali Ashram. 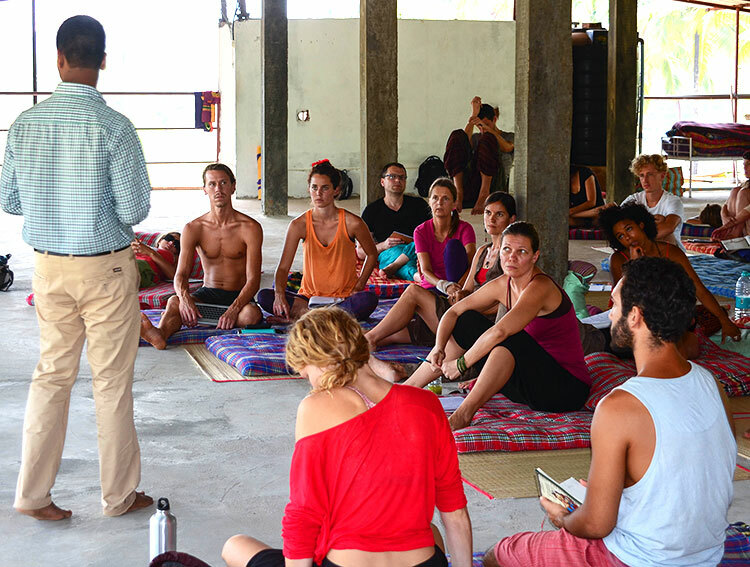 As such, this qualification can ONLY be completed in tandem with any of the Yoga Alliance USA Tantra Yoga Teacher Training Courses we offer. All students of Shri Kali Ashram are eligible. Basic pharmacology / bhaiṣajya kalpanā vijñānam भैषज्य कल्पना विज्ञानं that covers: dravyaguṇa vijñānam द्रव्यगुण विज्ञानं (rasa रस / taste, vīrya वीर्य / potency). Dr. Arun was born and raised in Calicut, Kerala, the heartland of traditional Āyurveda. He has been traditionally trained by his father and grandfather, with further accredited study from Dhanwantari Āyurvedic Medical College and Research Center, governed by the Rajiv Gandhi University of Health Sciences. Prior to joining us at Shri Kali Ashram, Dr. Arun had been practicing at Dhanwantari Vaidyasala based in Thodupuzha, Ernakulam, Kerala (a pioneer Āyurvedic school group in Kerala since 1931) and Indus Valley Āyurvedic Center, Mysore, Karnataka (Center of Yoga and Āyurveda). Dr. Arun's two assistants are also from Kerala and they help him with the various treatments offered at Shri Kali Ashram's medical center. These include Āyurvedic oil massage or Abhyanga अभ्यङ्ग, Shirodhara शिरोधर, and Pañcakarma पञ्चकर्म. They are available for Āyurvedic oil massage and Shirodhara by appointment throughout the week and Pañcakarma treatments are readily available by appointment and consultations made with Dr. Arun.